The journal publishes empirical papers, literature reviews, meta-analyses, and case-studies. 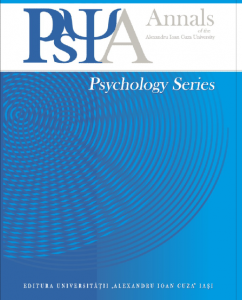 The journal is opened to all thematic areas from psychology, including, but not limited to social psychology, personality psychology, organizational psychology, research methodology, occupational health, developmental psychology, educational psychology, environmental psychology communication psychology and so on. Special attention is given to articles focusing on prevention and intervention. Interdisciplinary research that integrates psychology and other fields is also appreciated (e.g., psychology and law, psychology and sport, psychology and religion). Anale Psihologie © 2019. All Rights Reserved.